The N64 appeared during a time when I wasn't in the habit of buying every new console that hit the market. I wound up with a used unit in exchange for building an indoor turtle pond for a friend. Yeah, getting an Nintendo 64 was that odd. The Nintendo 64, often referred to as N64, is Nintendo's third home video game console for the international market. Named for its 64-bit CPU, it was released in June 1996 in Japan, September 1996 in North America, March 1997 in Europe and Australia, September 1997 in France and December 1997 in Brazil. It is Nintendo's last home console to use ROM cartridges to store games (Nintendo switched to a MiniDVD-based format for the successor GameCube); handhelds in the Game Boy line, however, continued to use Game Paks. It was discontinued in 2001 in Japan, North America and PAL regions by the launch of Nintendo's GameCube. 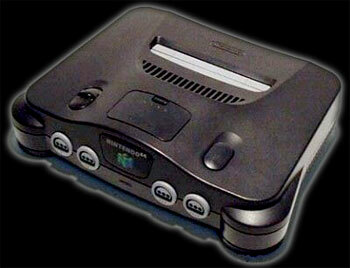 The N64 was released with two launch games, Super Mario 64 and Pilotwings 64, and a third in Japan, Saikyo Habu Shogi. The N64's suggested retail price was US$199 at its launch and it was later marketed with the slogan "Get N, or get Out!". The console was released in at least eight variants with different colors and sizes. An assortment of limited edition controllers were sold or used as contest prizes during the N64's lifespan. The N64 sold 32.93 million units worldwide, and in 2009 it was named the 9th greatest video game console by IGN, out of a field of 25. Of the consoles in the fifth generation, the Nintendo 64 was the last contender and the most technologically advanced. However, the console's storage medium had limitations that harmed the market competitiveness. A significant limitation was the small capacity and high production expense of cartridge-based media instead of the Compact Disc format used by competitors. The limited capacity forced game designers to struggle with fitting game content into a constrained space, though the faster access time of the cartridge medium offered other advantages over Compact Disc media. Another technical drawback was a limited texture cache, which could only hold textures of small dimensions and reduced color depth, which had to be stretched to cover larger in-game surfaces. The Nintendo 64 owes its existence to Silicon Graphics (SGI) and MIPS Technologies, who were responsible for the R4300i microprocessor and the 3D graphics hardware used in the N64. SGI had recently acquired MIPS Computer Systems, and the two worked together to create a low-cost real-time 3D graphics system. The SGI project was originally offered to Thomas Kalinske, then CEO of Sega of America, by James H. Clark, founder of Silicon Graphics. Sega of Japan's evaluation of the early prototype uncovered several unresolved hardware-issues and deficiencies. They were subsequently resolved; but not before Sega had already decided against SGI's design. In August 1993, Nintendo expressed interest in SGI's work, and "Project Reality" was born. An official announcement regarding their collaboration was made in October 1993. Nintendo's code name for the N64, "Project Reality", stemmed from the bold belief that the hardware's advanced CGI capabilities would rival supercomputers of the era. The console's design was revealed to the public for the first time in late Spring 1994. Pictures of the console showed the Nintendo Ultra 64 logo, a ROM cartridge, but no controller. The final N64 console would retain the shape pictured by the Ultra 64. The system was frequently marketed as the world's first 64-bit gaming system. Atari had claimed to have made the first 64-bit game console with their Atari Jaguar, but the Jaguar only used a 64-bit architecture in conjunction with two 32-bit RISC processors and a 16/32-bit Motorola 68000. Around the same time, Rare (UK) and Midway (USA) released two arcade titles, Killer Instinct and Cruis'n USA, which claimed to use the Ultra 64 hardware. Although Killer Instinct did use the same CPU as the N64, a MIPS R4300i, neither title was powered by Ultra 64 hardware. Killer Instinct featured pre-rendered character artwork, and CG movie backgrounds that were streamed off the hard drive and animated as the characters moved horizontally. The completed N64 was fully unveiled in a playable form to the public on November 24, 1995, at the 7th Annual Shoshinkai Software Exhibition in Japan. Nintendo's next-generation console was introduced as the "Nintendo 64", contrary to speculation that it would be called "Ultra Famicom". Photos of the event were disseminated on the web by Game Zero magazine two days later. Official coverage by Nintendo followed later via the Nintendo Power website and print magazine. The console was first released in Japan on June 23, 1996. By this time, Nintendo had adopted a new global branding strategy, assigning the console the same name for all markets: Nintendo 64. The North American version of the Nintendo 64 officially launched on September 29, 1996 with 500,000 units sold in the first four months, while the PAL version was released in Europe on March 1, 1997. As of December 31, 2009, the N64 had sold 5.54 million units in Japan, 20.63 million in the Americas, and 6.75 million in other regions, for a total of 32.93 million units. Benimaru Ito, a developer for EarthBound 64 and friend of Shigeru Miyamoto, speculated in 1997 that the N64's lower popularity in Japan was due to the lack of role-playing video games. Because of the cost of Nintendo 64 cartridges, and limited third-party support, the Nintendo 64 caused Nintendo to lose its leading position in its market share. The Nintendo 64's central processing unit (CPU) is the NEC VR4300, a cost-reduced derivative of the 64-bit MIPS Technologies R4300i. Built by NEC on a 0.35 µm process, the VR4300 is a RISC 5-stage scalar in-order execution processor, with integrated floating point unit, internal 24 KB direct-mapped L1 cache (16KB for instructions, 8KB for data). The 4.6 million transistors CPU is cooled passively by an aluminum heatspreader that makes contact with a steel heat sink above. Clocked at 93.75 MHz, the N64's VR4300 was the most powerful console CPU of its generation. Except for its narrower 32-bit system bus, the VR4300 retained the computational abilities of the more powerful 64-bit MIPS R4300i, though software rarely took advantage of 64-bit data precision operations. N64 game-titles generally used faster (and more compact) 32-bit data-operations, as these were sufficient to generate 3D-scene data for the console's RSP (Reality Signal Processor; see below) unit. Though powerful, the CPU was hindered by a 250MB/s bus to the system memory; not only that, but in order to access the RAM, the CPU had to go through the RCP (Reality Co-Processor), and could not use DMA to do so (the RCP could). This problem is further compounded by the RDRAM's very high access latency. Emulators such as UltraHLE and Project64 benefit from the scarcity of 64-bit operations in the game's executable-code, as the emulator is generally hosted on a 32-bit machine architecture. These emulators performed most calculations at 32-bit precision, and trapped the few OS subroutines that actually made use of 64-bit instructions. Nintendo 64's graphics and audio duties are performed by the 64-bit SGI co-processor, named the "Reality Co-Processor". The RCP is a 62.5 MHz chip split internally into two major components, the "Reality Drawing Processor" (RDP) and the "Reality Signal Processor" (RSP). Each area communicates with the other by way of a 128-bit internal data bus that provides 1.0 GB/s bandwidth. The RSP is a MIPS R4000-based 8-bit integer vector processor. It is programmable through microcode, allowing the chip's functions to be significantly altered if necessary, to allow for different types of work, precision, and workloads. The RSP performs transform, clipping and lighting calculations, triangle setup. The "Reality Display Processor" is primarily the Nintendo 64's Pixel Rasterizer, and also handles the console's Z-Buffer Compute. The RSP was programmable through microcode (µcode). By altering the microcode run on the device, it could perform different operations, create new effects, and be better tuned for speed or quality; however, Nintendo was unwilling to share the microcode tools with developers until the end of the Nintendo 64's life-cycle. Programming RSP microcode was said to be quite difficult because the Nintendo 64 µcode tools were very basic, with no debugger and poor documentation. As a result, it was very easy to make mistakes that would be hard to track down, mistakes that could cause seemingly random bugs or glitches. Some developers noted that the default SGI microcode ("Fast3D") was poorly profiled for use in games (it was too accurate), and performance suffered as a result. Several companies, such as Factor 5, Boss Game Studios and Rare, were able to write custom microcode that ran their software better than SGI's standard microcode. Fast3D microcode: < ~100,000 high accuracy polygons per second. Turbo3D microcode: 500,000-600,000 normal accuracy polygons per second. However, due to the graphical degradation, Nintendo discouraged its use. The RSP also frequently performs audio functions (although the CPU can be tasked with this as well). It can play back most types of audio (dependent on software codecs) including uncompressed PCM, MP3, MIDI, and tracker music. The RSP is capable of a maximum of 100 channels of PCM at a time, but this is with 100% system utilization for audio. It has a maximum sampling rate of 48 kHz with 16-bit audio; however, storage limitations caused by the cartridge format limited audio size (and thus quality). The RDP is the machine's rasterizer and performs the bulk of actual image creation before output to the display. The Nintendo 64 has a maximum color depth of 16.8 million colors (32,768 on-screen) and can display resolutions of 256 × 224, 320 × 240 and 640 × 480 pixels. The RCP also provides the CPU's access to main system memory via a 250 MB/s bus. Unfortunately, this link does not allow direct memory access for the CPU. The RCP, like the CPU, is passively cooled by an aluminum heatspreader that makes contact with a steel heat sink above. The final major component in the system is the memory, also known as RAM. The Nintendo 64 was one of the first modern consoles to implement a unified memory subsystem, instead of having separate banks of memory for CPU, audio, and video, for example. The memory itself consists of 4 megabyte of RAMBUS RDRAM (expandable to 8 MB with the Expansion Pak) with a 9-bit data bus at 500 MHz providing the system with 562.5 MB/s peak bandwidth. RAMBUS was quite new at the time and offered Nintendo a way to provide a large amount of bandwidth for a relatively low cost. The narrow bus makes board design easier and cheaper than the higher width data buses required for high bandwidth out of slower-clocked RAM types (such as VRAM or EDO DRAM); however, RDRAM, at the time, came with a very high access latency, and this caused grief for the game developers because of limited hardware performance. The system provides both composite video and S-Video through the "MULTI OUT" connector on the rear of the system; however, the Nintendo 64 removed certain pin connections for providing RGB video, despite the DAC chip used in early models having the capability built-in. In most countries the system came bundled with a composite cable (AKA Stereo AV cable) The composite and S-Video cables are the same as those used with the earlier SNES and later GameCube systems. Available to buy separately was a RF modulator and switch set (for connection to older televisions) and an official S-Video cable, although the latter was only sold at retail stores in Japan. In the US the official S-Video cable could only be ordered direct from Nintendo of America, and the cable was not officially sold in Europe. In the United Kingdom the N64 was shipped with a RF modulator and switch set, but was still fully compatible with the other cables. The system supports SDTV resolutions up to 480i although few games made use of this 'high resolution' mode, many of which required the use of the Expansion Pak RAM upgrade. The majority of games instead used the system's 240p/288p modes. A number of games also support a video display ratio of up to 16:9 using either Anamorphic widescreen or Letterboxing. However, very few of its games provided options to use this feature, these were: Banjo-Tooie, Donkey Kong 64, GoldenEye 007, The World Is Not Enough, Jet Force Gemini, Perfect Dark, Starshot: Space Circus Fever, Turok 2: Seeds of Evil, Turok 3: Shadow of Oblivion, Mission Impossible, South Park. The standard Nintendo 64 is dark gray, nearly black, and the controller is light gray (later releases in America included a bonus second controller in Atomic Purple). A Jungle Green colored console was first available with the Donkey Kong 64 bundle. The Funtastic Series used brightly-colored, translucent plastic with six colors: Fire Orange, Grape Purple, Ice Blue, Jungle Green, Smoke Gray and Watermelon Red. Nintendo released a yellow banana-like Nintendo 64 controller for the debut of Donkey Kong 64 in the United States. The Millennium 2000 controller, available exclusively as part of a Nintendo Power promotional contest in the United States, was a silver controller with black buttons. A gold controller was released in a contest by Nintendo Power magazine as part of a raffle drawing. In late 1997 through 1998, a few gold Nintendo 64 controller packages were released worldwide; in the United Kingdom there was a limited edition GoldenEye 007 console pack which came with a standard gray console and a copy of GoldenEye. Also, a limited edition gold controller with a standard gray console were released in Australia and New Zealand in early 1998, endorsed by an advertising campaign which featured footage of N64 games including Top Gear Rally and ended with Australian swimmer Michael Klim wearing the gold controller as a medal around his neck. Nintendo released a gold controller for the debut of The Legend of Zelda: Ocarina of Time in Japan. Soon after, bundle packs of the game, controller, and gold Nintendo 64 were released for the US and PAL markets. The Pokémon Edition Nintendo 64, with a Pokémon sticker on the left side, included the "Pokémon: I Choose You" video. The Pokémon Pikachu Nintendo 64 had a large, yellow Pikachu model on a blue Nintendo 64. It has a different footprint than the standard Nintendo 64 console, and the Expansion Pak port is covered. It also shipped with a blue Pokémon controller; orange in Japan. A Limited Edition Star Wars bundle, available during the time of the release of the film Star Wars Episode I: The Phantom Menace came bundled with Star Wars: Episode I Racer and a standard gray console. Nintendo released some special edition consoles and controllers that were sold only on specific stores. There were two other Japan only consoles that were exclusive to specific stores. One was the Daiei Hawks which was only sold in Daiei Hawks stores. And the other was the Jusco 30th anniversary, which was only sold in Jusco stores. The Daiei Hawks featured an orange translucent top, and a black translucent bottom, very similar to the Fire Orange and Smoke Black Nintendo 64, although not the same. The Jusco 30th anniversary, featured a very light violet-translucent color on the top, and white translucent on the bottom. These two consoles were released with a controller that matched with their console. The Daiei Hawks also sold separate controllers. Due to the insane rarity of the Jusco 30th anniversary, it is unknown whether a separate controller was sold or not. Nintendo also released a black (top) and grey (bottom) controller that was bundled with Mario Kart 64, only sold in Japan. A similar controller to the Mario Kart 64, was only sold in Hello Mack stores, and the controller featured a Hello Mack picture on the top of the controller. In America, Toys "R" Us released their own series of store exclusive products. The Extreme Green, Extreme Green console bundle, Gold Controller bundle, and a very limited Gold Nintendo 64 which was bundled with two gold controllers. The majority of Nintendo 64 game cartridges were gray in color; however, some games were released on a colored cartridge. Fourteen games had black cartridges, while other colors (such as green, blue, red, yellow and gold) were each used for six or fewer games. Several games, such as The Legend of Zelda: Ocarina of Time were released both in standard gray and in colored, limited edition versions. The Nintendo 64 had weaknesses that were caused by a combination of oversight on the part of the hardware designers, limitations on 3D technology of the time, and manufacturing capabilities. One major flaw was the limited texture cache of 4 KB. This made it difficult to load anything but small, low color depth textures into the rendering engine. This small texture limitation caused blurring due to developers stretching small textures to cover a surface, and then the console's bilinear filtering would blur them further. To make matters worse, due to the design of the renderer, if mipmapping was used, the texture cache was effectively halved to 2 KB. Towards the end of Nintendo 64's lifetime, creative developers managed to use tricks, such as multi-layered texturing and heavily-clamped, small texture pieces, to simulate larger textures. Perfect Dark, Banjo-Kazooie, and Conker's Bad Fur Day are possibly the best examples of this ingenuity, all of which were developed by Rare. Games often also used plain colored Gouraud shading instead of texturing on certain surfaces, especially in games with themes not targeting realism (e.g., Super Mario 64). There were other challenges for developers to work around. Z-buffering significantly crippled the RDP's fill rate. Thus, for maximum performance, most Nintendo 64 games were actually fill-rate limited, not geometry limited, which is ironic considering the great concern for the Nintendo 64's low polygon per second rating of only about 100,000; however, some of the most polygon-intense Nintendo 64 games, such as World Driver Championship, frequently pushed past the Sony PlayStation's typical in-game polygon counts. The unified memory subsystem of Nintendo 64 was another critical weakness for the machine. The RDRAM had very high access latency, which nearly negated its high bandwidth advantage. In addition, game developers commented that the Nintendo 64's memory controller setup was poor. The R4300 CPU was severely limited at memory access since it had to go through the RCP to access main memory, and could not use DMA to do so. One of the best examples of custom microcode on the Nintendo 64 was Factor 5's N64 port of the Indiana Jones and the Infernal Machine PC game. The Factor 5 team aimed for the high resolution mode (640 × 480) because of the crispness it added to the visuals. The machine was taxed to the limit running at 640 × 480, so they needed performance beyond the standard SGI microcode. The Z-buffer could not be used because it alone consumed the already-constrained texture fill-rate. To work around the 4 KB texture cache, the programmers came up with custom texture formats and tools to let the artists use the best possible textures. Each texture was analyzed and fitted to best texture format for performance and quality. They took advantage of the cartridge as a texture streaming source to squeeze as much detail as possible into each environment and work around RAM limitations. They wrote microcode for real-time lighting, since the SGI code was poor for this task and they wanted to have even more lighting than the PC version had used. Factor 5's microcode allowed almost unlimited real-time lighting and significantly boosted the polygon count. In the end, the game was more feature-filled than the PC version, and unsurprisingly, was one of the most advanced games for Nintendo 64. Factor 5 again used custom microcode with games such as Star Wars: Rogue Squadron and Star Wars: Battle for Naboo. In Star Wars: Rogue Squadron, the team tweaked the microcode for a landscape engine to create the alien worlds. For Star Wars: Battle for Naboo, they used what they learned from Rogue Squadron and made the game run at 640 × 480, also implementing enhancements for particles and the landscape engine. Battle for Naboo had a long draw distance and large amounts of snow and rain, despite the high resolution. Nintendo 64 games were ROM cartridge based. Cartridge size varied from 4 MB (32 Mbit) (e.g. Automobili Lamborghini and Dr. Mario 64) to 64 MB (512 Mbit) for Resident Evil 2 and Conker's Bad Fur Day. Some of the cartridges included internal EEPROM, flash memory or battery-backed-up RAM for saved game storage. Otherwise, game saves were put onto a separate memory card, marketed by Nintendo as a Controller Pak. The selection of the cartridge for the Nintendo 64 was a controversial decision and a key factor in Nintendo's being unable to retain its dominant position in the gaming market. Most of the cartridge's advantages did not manifest themselves prominently and they were nullified by the cartridge's shortcomings, which disappointed customers and developers alike. Especially for the latter, it was costly and difficult to develop for ROM cartridges, as their limited storage capacity (64 MB or a mere 10% of a PlayStation CD-ROMs 640 MB capacity) constrained the game's content. Most third-party developers switched to the PlayStation, such as Square and Enix, whose Final Fantasy VII and Dragon Quest VII were initially pre-planned for the N64, while some who remained released fewer games to the Nintendo 64. Konami was the biggest example of this, releasing only thirteen N64 games but over fifty on the PlayStation. New Nintendo 64 game releases were infrequent while new games were coming out rapidly for the PlayStation. Most of the N64's biggest successes were developed by either Nintendo itself or by second-parties of Nintendo, such as Rareware. Despite the difficulties with third-parties, the N64 still managed to support popular games such as GoldenEye 007, giving it a long shelf-life. Much of this success was credited to Nintendo's strong first-party franchises, such as Mario, which had strong name brand appeal, yet appeared exclusively on Nintendo platforms. The N64 also secured its share of the mature audience, due to GoldenEye 007, Nightmare Creatures, Perfect Dark Legend Of Zelda: Ocarina Of Time, Doom 64, Resident Evil 2, Shadow Man, Conker's Bad Fur Day, Duke Nukem 64, Duke Nukem: Zero Hour, Mortal Kombat 4, Turok: Dinosaur Hunter, Turok 2: Seeds of Evil, and Quake II. Nintendo cited several advantages for making the N64 cartridge-based. Primarily cited was the ROM cartridges' very fast load times in comparison to disc-based games, as contemporary CD-ROM drives rarely had speeds above 4×. This can be observed from the loading screens that appear in many PlayStation games but are typically non-existent in N64 versions. ROM carts were much faster than the 2× CD-ROM drives in other consoles that developers could stream data in real-time from them. This was done in Indiana Jones and the Infernal Machine, for example, to make the most of the limited RAM in the N64. Also, ROM cartridges are difficult and expensive to duplicate, thus resisting piracy, albeit at the expense of lowered profit margin for Nintendo. While unauthorized interface devices for the PC were later developed, these devices are rare when compared to a regular CD drive and popular mod chips used on the PlayStation. Compared to the N64, piracy was rampant on the PlayStation. The cartridges are also far more durable than compact discs, the latter which must be carefully used and stored in protective cases. It also prevents accidental scratches and subsequent read errors. It is possible to add specialized I/O hardware and support chips (such as co-processors) to ROM cartridges, as was done on some SNES games (including Star Fox, using the Super FX chip). ROM cartridges also have disadvantages associated with them. While game cartridges are more resistant than CDs to physical damage, they are sometimes less resistant to long-term environmental damage, particularly oxidation (Although this can be simply cleaned off) or wear of their electrical contacts causing a blank or frozen screen, or static electricity. Thus, many players found themselves constantly having to blow the dust out of the game packs in order for the game to simply load sometimes. Console cartridges are usually larger and heavier than optical discs, requiring greater storage space. They also have a more complex manufacturing processes; cartridge-based games were usually more expensive to manufacture than their optical counterparts. The cartridges can have a maximum of 64 MB of data, whereas CDs held over 650 MB. As fifth generation games became more complex in content, sound and graphics, it pushed cartridges to the limits of their storage capacity. Games ported from other media had to use data compression or reduced content to be released on the N64. Extremely large games could be made to span across multiple discs on CD-based systems, while cartridge games had to be contained within one unit as using an additional cartridge was prohibitively expensive (and was never tried). Due to the cartridge's space limitations, full motion video was not usually feasible for use in cut scenes, with the exception of Resident Evil 2. The cut scenes of some games used graphics generated by the CPU in real-time. A total of 387 games were released for the console though few were exclusively sold in Japan, in competition with around 1,100 games released for the rival PlayStation as well as both the NES and SNES having 768 and 725 US-released games respectively. However, the Nintendo 64 game library included a high number of critically acclaimed and widely sold games. Super Mario 64 was the console's best selling game (selling over eleven million copies) and also received praise from critics; GoldenEye 007 was important in the evolution of the first person shooter, and has since been named the greatest in the genre; and The Legend of Zelda: Ocarina of Time is frequently regarded as the greatest game of all time. Graphically, results of the Nintendo cartridge system were mixed. The N64's graphics chip was capable of trilinear filtering, which allowed textures to look very smooth compared to the Saturn or the PlayStation. This was due to the latter two using nearest-neighbor interpolation, resulting in textures that were pixelated. However, the smaller storage size of ROM cartridges limited the number of available textures, resulting in games that had blurry graphics. This was caused by the liberal use of stretched, low-resolution textures, and was compounded by the N64's 4096-byte limit on a single texture. Some games, such as Super Mario 64, use a large amount of Gouraud shading or very simple textures to produce a cartoon-like image. This fit the themes of many games, and allowed this style of imagery a sharp look. Cartridges for some later games, such as Resident Evil 2 and Sin & Punishment: Successor of the Earth, featured more ROM space, allowing for more detailed graphics. The era's competing systems from Sony and Sega (the PlayStation and Saturn, respectively) used CD-ROM discs to store their games. These discs are much cheaper to manufacture and distribute, resulting in lower costs to third-party game publishers. As a result, game developers who had traditionally supported Nintendo game consoles were now developing games for the competition because of the higher profit margins found on CD-based platforms. Cartridges took longer to manufacture than CDs, with each production run (from order to delivery) taking two weeks or more. By contrast, extra copies of a CD based game could be ordered with a lead time of a few days. This meant that publishers of N64 titles had to attempt to predict demand for a game ahead of its release. They risked being left with a surplus of expensive cartridges for a failed game or a weeks-long shortage of product if they underestimated a game's popularity. The cost of producing an N64 cartridge was far higher than producing a CD. Publishers had to pass these higher expenses to the consumer and as a result, N64 games tended to sell for higher prices than PlayStation games. While most PlayStation games rarely exceeded US$50, N64 games could reach US$79.99, such as the first pressing of The Legend of Zelda: Ocarina of Time. Games in Sony's line of PlayStation Greatest Hits budget line retailed for US$19.95, while Nintendo's equivalent Player's Choice line retailed for US$29.95. In the United Kingdom, N64 games were priced £54.95 at their time of release, while PlayStation games were priced at £44.95. In the United States games were priced at around roughly $49.99 at the time of their release. Each Nintendo 64 cartridge contains a lockout chip (similar to the 10NES) to prevent manufacturers from creating unauthorized copies of games and discourage production of unlicensed games. Unlike previous versions, the N64 lockout chip contains a seed value which is used to calculate a checksum of the game's boot code. To discourage playing of copied games by piggybacking on a real cartridge, Nintendo produced five different versions of the chip. During the boot process, and occasionally while the game is running, the N64 computes the checksum of the boot code and verifies it with the lockout chip in the game cartridge, failing to boot if the check fails. Some of Nintendo's N64 titles have been released for the Wii's Virtual Console service and are playable with either the Classic Controller or Nintendo GameCube controller. There are some differences between these versions and the original cartridge versions. For example, the games run in a higher resolution and at a more consistent framerate than their N64 counterparts. However, some features, such as Rumble Pak functionality, are not featured in the Wii versions. Some features are also altered for the Virtual Console releases. For example, the VC version of Pokémon Snap allows players to send photos through the Wii's message service, while Wave Race 64's in-game content was altered due to the expiration of the Kawasaki license. Several titles from Rare have seen release on Microsoft's Xbox Live Arcade service, including Banjo-Kazooie, Banjo-Tooie and Perfect Dark, the reason being that Rareware was purchased by Microsoft in 2002. While the Virtual Console featured on the Wii has been a successful way to relaunch old successful titles, prior to its conception many fans have dedicated time to create emulation systems for their home computers in order to play old favorites that Nintendo has left to history. Project64, 1964, and UltraHLE are currently the top-ranked emulators at The Emulator Zone.